SAN ANTONIO – Nate Mason was feeling his shot, but he decided at the last moment to swing the ball to the right at the end of the shot clock to teammate Robert Johnson. Gopher to Hoosier. Three-point swish. Game over. Mason gave out a loud scream with excitement. His Big Ten team defeated the Big West 21-13 to win the 3-on-3 national championship and $50,000 to split between four players, including Purdue’s Vincent Edwards and Ohio State’s Jae’Sean Tate. They grabbed hundreds of dollar bills in a chest and tossed money in the air in celebration Sunday night. 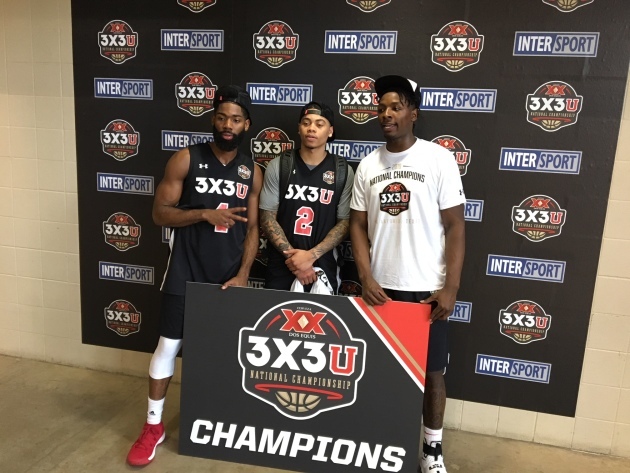 The first annual 3X3U national championship put all-star teams with 128 players from 32 Division I conferences in a three-day competition at St. Mary’s University in San Antonio. All six high-major conferences were represented, including the Big East led by former Xavier and Lakeville North star JP Macura. There’s no doubt 3-on-3 basketball is becoming more popular worldwide. It will make its debut in the 2020 Olympics in Tokyo. In San Antonio, the rules were the first team to 21 or the best score after 10 minutes wins. Every basket inside the arc was worth a point and behind the arc was worth two points with a 12-second shot clock. Mason led the Big Ten team with nine points on 6-for-12 shooting (3-for-6 from three-point range) and seven rebounds Sunday. He hit step-back threes and zipped past his defender off the dribble for layups in the half-court game. The 6-foot-2 Georgia native resembled the player Gophers fans saw lead the U to 24 wins and the NCAA tournament in 2016-17 after winning All-Big Ten first team honors. Minnesota had a disappointing 15-17 record this season dealing with injuries and off-court issues, but Mason finished his career fifth all-time in points and second in assists in school history. Mason will be training in Miami this month to prepare for the Portsmouth Invitational April 11-14 in Virginia. His goal is to be invited to the NBA combine and impress during workouts leading up to the draft in June. After being a mentor to freshman point guard Isaiah Washington this season, Mason hopes to see his former teammate help lead the Gophers back to the NCAA tournament next season.